Three LTTE cadres were killed and several others injured when the STF beat back a Tiger attack on the Kohambagasthalawa Home Guards post on the Ampara-Mahaoya Road last morning. A Home Guard was killed in the incident, the Media Centre for the National Security (MCNS) said. 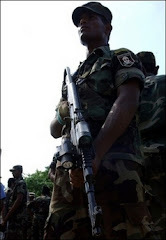 According to a spokesman for MCNS LTTE cadres attacked the Home Guard post in Kohambagasthalawa yesterday around 8.00 a.m. STF reinforcements were rushed to the scene. The attack was successfully repulsed resulting in the deaths of three LTTE cadres with several others injured. The confrontation lasted for three hours and the Tigers fled from the area in the face of the retaliation, he added. The spokesman said in a subsequent search of action, Security Forces recovered three hand grenades and three firearms. Meanwhile, 12 civilians were injured when a claymore mine went off in Aranthalawa, Ampara on Tuesday night. The MCNS spokesman said 12 civilians travelling in a van from Nindavur to Kandy were injured when the LTTE detonated a claymore mine. The explosion took place opposite the plaque constructed to commemorate 30 Buddhist Monks and four civilians killed by the LTTE on May 1987 in Aranthalawa.